Another week, another brilliant heap of shows going on sale! 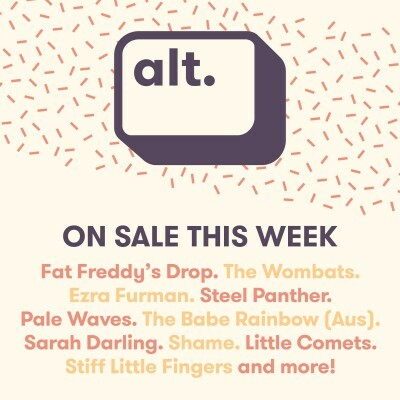 Including Fat Freddy's Drop, The Wombats, Ezra Furman and more. Take a listen below and find out how to get your hands on tickets for these unmissable gigs. Known for their incredible live performances, New Zealand's finest Fat Freddy's Drop return to the UK in November 2018. With sold out shows across the world, you want want to miss the seven-piece live in Birmingham, Manchester, Glasgow and London! Tickets go on sale on Friday at 10am. Buy your Fat Freddy's Drop tickets here. The Wombats are back! As well as announcing their new album, including a brilliant new track 'Lemon To A Knife Fight', the Liverpool trio have also confirmed a UK tour which comes to Nottingham's Rock City on 21st March! Tickets go on sale on Friday at 9am. Buy your The Wombats tickets here. To celebrate the release of upcoming album 'Transangelic Exodus', Chicago musician Ezra Furman will return to the UK next year for must-see shows at Bristol's Colston Hall and Manchester's The Albert Hall. Tickets go on sale on Friday at 10am. Buy your Ezra Furman tickets here. Comedic glam metal band Steel Panther have extended their 2018 Lower The Bar Tour and even more good news, they're coming to Nottingham for a show at Rock City on 23rd January. Tickets are on sale now! Buy your Steel Panther tickets here. Fresh from their hugely successful headline tour, Pale Waves have announced they'll hit the road again in March, this time as part of DIY Magazine's Class of 2018 tour with special guests Our Girl and Bloxx. Tickets go on sale on Friday at 9am. Buy your Pale Waves tickets here. Byron Bay three-piece The Babe Rainbow mark the release of the eponymous debut album with 2018 live dates! Catch the band live at Nottingham's The Bodega and London's Scala in February! Tickets go on sale on Friday at 9am. Buy your The Babe Rainbow tickets here. After selling out her show at St Pancras Old Church next month, country musician returns to the capital on 5th March for a headline show at Union Chapel! Tickets go on sale on Friday at 10am. Buy your Sarah Darling tickets here. ALSO ON SALE THIS WEEK! Shame, Little Comets, Stiff Little Fingers, Banfi, Tom Walker, Nicole Atkins, Franc Moody and more!